Your Wedding Gown Preservation Kit contains several items to make the process easier for both brides and for us to identify problem areas. Crush-Proof Box - this is for safely shipping your wedding gown to our facility. Preservation Bag - This is a heavy duty water proof bag to place your gown in to be sure no water or moisture can damage your dress during shipment. Paperwork - This will contain your pre-paid shipping label to fill out as well as an extra copy for your records. You'll also be able to add your e-mail address you want to receive updates to and you can include a check for any additional (4 or more) items you'd like to include to be preserved. Stain Stickers - Use these fabric-friendly stickers to point out any stains that are visible to you on your dress. This helps us with the stain identification process during cleaning. Packaging Tape - This is heavy duty packing tape to seal the box up for the trip to our facility. Instructions - Detailed instructions come with the kit to give you peace-of-mind that you did everything correctly. 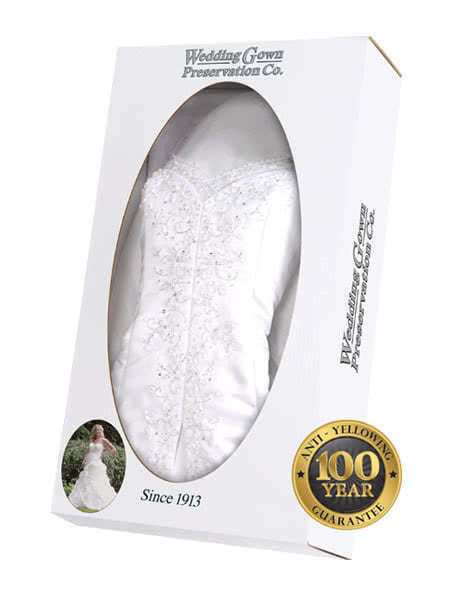 Preservation Chest - Our box comes sealed with your cleaned and preserved wedding gown and accessories inside. Preservation Bust - Within the chest, your gown is lovingly formed to our custom shaped bust to help keep the shape of your gown and avoid fabric wrinkles over time. Preservation Box - Your preservation chest will be stored in our high density preservation box with handle that keeps your preservation chest in perfect condition over the years. White Gloves - We stand behind our service and even include white gloves so you can examine your preservation and be sure you're 100% satisfied with our work. Guarantee - You'll receive your 100 year guarantee on our service in the form of a certificate so you can file it away for your records. As you can see we've covered everything when it comes to preserving your wedding gown. We've been helping brides preserve their gowns for over 100 years so why trust anyone else with your most prized keepsake from your wedding day?